Yesterday’s price action in the precious metals market might seem perplexing to some investors and there’s good reason for it. Gold declined, but silver didn’t, and mining stocks actually managed to rally more than 1%. Let’s take a closer look (charts courtesy of http://stockcharts.com). Gold moved to its recent lows, but didn’t move below them. Technically, the situation hasn’t changed because of that, and thus, the outlook remains bearish, but it’s still possible that we will see some sideways movement or a small move higher before the decline really continues. We still haven’t seen any breakdown, but we saw an attempt to move below the recent lows – a failed attempt. 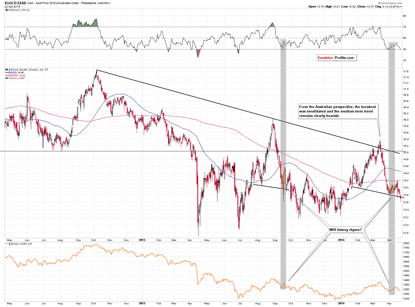 The latter is a bullish sign for the short term, even though the medium-term trend remains unaffected and down. 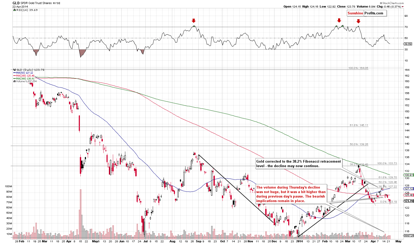 Moreover, please note that the GLD ETF has just formed a reversal hammer candlestick.